You can add up to 45 fields to your recipient lists. 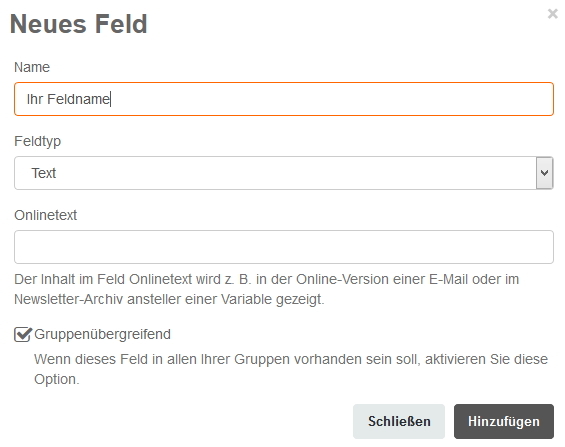 After creating the new fields you can either fill them with data manually or by importing a file. Just go to the list and click on [Settings] > [Fields]. There you can see all saved fields, divided into list fields and intergroup fields. In general, we recommend using intergroup fields, find further details here. To add a new field, click on [New Field] and enter a name for your new field. 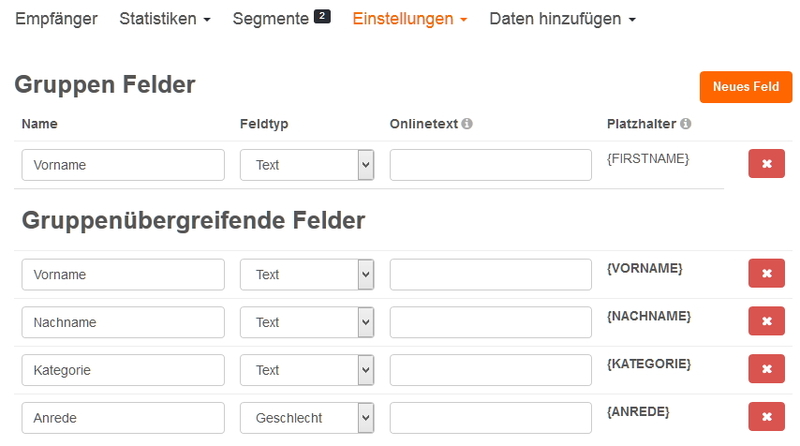 Intergroup (selected by default): Fields applying to all lists. This is necessary if e.g. multiple groups should be addressed and the recipients should receive a personalized salutation (find more information here). Make sure that field names are unique (e.g. First Name as group field and additionally as intergroup field). Whenever you delete fields from your account all data contained in those fields will be lost for all recipients. In general, we recommend to always manage intergroup fields. Fields cannot have the same name as our system fields. They are: "email", "id", "registered", "activated", "deactivated", "pool_id", "imported", "bounced", "bounce", "active", "source", "unsubscribe", "userid", "filter", "group_id", "blacklist", "tags" and "crtags". Can I deactivate the Captcha in my forms?